Augsburg College health and physical education (HPE) and exercise science students used knowledge gained in the classroom to deliver smiles to more than 200 children in grades 3-6 at Sports Extravaganza, an annual one-day event through which children with mental or physical disabilities exercise and play on campus. The success of Sports Extravaganza, held November 14, hinged upon the participation of Augsburg students, as well as additional student volunteers from North Hennepin Community College. 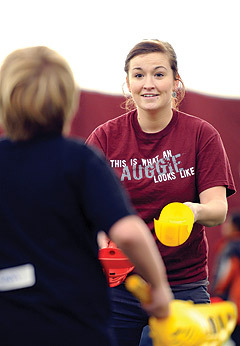 Together, students and faculty members created activity stations in the Augsburg Athletics dome and then assisted children with each activity, according to Carol Enke, Sports Extravaganza director and Augsburg College HPE instructor. "Augsburg students take what they've learned in the classroom and then go out and do this event," Enke said. "The young students come to campus, and they help [Augsburg] students grow." Sports Extravaganza is an opportunity for College students to teach a young population they may not have worked with previously. Augsburg students problem solve, use encouraging messages and motivation techniques, and increase their adeptness at instructing disabled children. "It's so cool. This little guy named Charlie had everyone getting involved and coming out of their shell," Enke said. Event participants played adapted games and completed activities that included bowling, soccer, relay races, dancing, and more. The carefully planned stations had emotional and physical benefits for the children. "This is more than just a huge, huge playday for them," Enke said. "They get to work on developing their motor skills for a whole day." Sports Extravaganza was founded in 1999 and continues to be an annual College tradition due to its myriad benefits for Twin Cities area children and Augsburg students enrolled in nearly a half-dozen HPE courses. This year's Sports Extravaganza was organized by Enke and three teachers who instruct developmental adapted physical education in Twin Cities metro area primary schools. Sports Extravaganza students came from the Bloomington, Buffalo, Hopkins, Minneapolis, Moundsview, Oakdale, Richfield, Stillwater, and Wayzata school districts. Turnout for the event was "absolutely fantastic," according to Enke. "There's no way to describe the smiles on the children's faces as they're playing," Enke said. "It's truly something you have to see." View those grins on the Sports Extravaganza 2012 Flickr photo set.